Sometimes when I'm at work, I'll have a really great idea for a blog post that is completely unrelated to work. The sentences start forming in my head, and I think to myself, "Man, I should really be writing this down," but instead, I have to write about something more boring, like work. And then I get home and sit down to write a blog post, and I've completely forgotten what I wanted to write about. So it goes with this chicken adobo. I knew exactly what I wanted to write for this chicken adobo post last week, sometime around two in the afternoon, when I was sitting at my desk staring at a spreadsheet and dreaming about dinner. And now, I just can't remember. I should really write these things down. I'm the same way with recipes. I've been getting better about following recipes more precisely, ever since I started counting calories and cooking lighter foods. But then there are those recipes that just kind of float around in the back of my head, with no real measurements or times, just eyeball-and-taste methods that always seem to work out OK in the end. And I'm left with a dish I've made a million times before, with no real way to share it with you because I never thought to pay attention to how much onion I actually chopped, and how much soy sauce was in that "dash," and how long it took to taste just right. Until now. 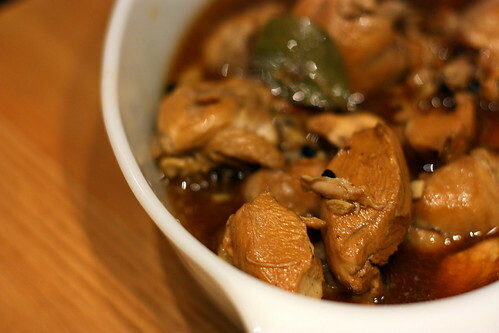 Today, I present you with my family's chicken adobo recipe. I've written about chicken adobo here before, and how I grew up with the smell of chicken adobo in the kitchen, and how learning to make it in college was like bringing my mother's kitchen to my own. It's still like that. The rich aroma of chicken simmering slowly in soy sauce, garlic, and vinegar will always mean "home" to me. One of my favorite things about this recipe, besides the smell and of course, the taste, is that it's just about the easiest dish to make. 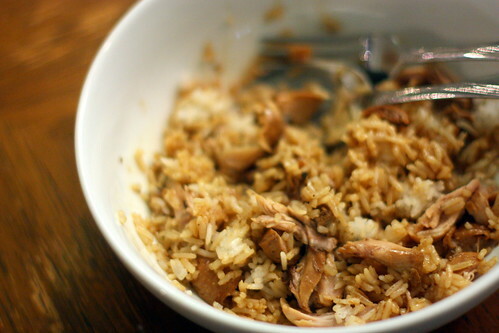 It's a simple chicken and rice dish, made with bone-in chicken pieces, although for a long time, I used to make it only with boneless, skinless chicken breasts simply for convenience's sake. Also, I didn't own a good cleaver, but more on that later. Chicken adobo made solely with boneless, skinless chicken breasts is not real chicken adobo. It's good, but it's not authentic. It'll do in a pinch, but it just doesn't taste the same. Real chicken adobo requires bone-in chicken pieces. I use chicken drumsticks, whacked in half crosswise with a good cleaver (a wedding gift, yay! no more fake adobo in this kitchen! ), exposing the bone marrow to make the broth richer and more flavorful. Then comes the sauce, which involves equal parts water, vinegar, and soy sauce. That's the beauty of this dish -- as long as you have equal parts of these key ingredients, in addition to plenty of garlic, you really can't screw up the flavor. For four pounds of chicken, I used a cup of each, which was just enough to almost cover the chicken. A couple of bay leaves, a pinch of whole black peppercorns, and an hour of simmer time, and you'll have tender, fall apart chicken that is sweet and tangy, garlicky and rich. A true Filipino classic. Adobo refers to the process of simmering in soy sauce, vinegar, and garlic. Anything can be adobo-ed, including pork, ribs, and even veggies, although I've never tried vegetarian adobo. I prefer chicken adobo. If you don't own a good cleaver to cut the chicken in half, then simply leave the pieces whole. It'll still taste great. The vinegar helps it keep longer than your usual chicken dish, and is actually better the next day. After it's refrigerated, the broth gets kind of gelatinous, which can look gross but don't be alarmed. Just skim the fat off the top and it'll reheat beautifully. Throw everything (except for the rice) into a large pot or Dutch oven. Bring to a boil, then lower heat and let simmer, covered, for 45 minutes to an hour, stirring occasionally. You'll know it's done when the meat begins to separate from the bone. Remove bay leaves and serve over white rice. This makes a lot of adobo. I made this much and it fed 2 people for three meals. So about 6 servings. i adore dishes like this: something you grew up with but so flipping easy to create. & i'm a huge fan of bone-in chicken, specifically drumsticks. i've been known to whip out my blackberry to tap away on the notepad, to jot down whatever has popped into my head. i hate the feeling of sitting down to write & whatever i thought an hour ago is gone. girl, ain't nothing gets in the way of my thought & writing process. White Vinegar? I want to make this RIGHT NOW, but am stuck in the pesky office. Will be making this for dinner tonight. Definitely. Lan - I have a love/hate relationship with bone-in chicken. I love the flavor it produces, but the bones do get in the way sometimes. With this dish, though, it's certainly worth it. You're totally right about the writing/thought process! I bring a notebook with me wherever I go, and I'm going to try to make a better habit of jotting down ideas no matter where I am. Even at work, if only for a few minutes. Darbyoshea - Ah, there goes that pesky office getting in the way of things again! I use plain old distilled white vinegar for this dish. Thanks for catching that detail -- I've added it to the recipe. So excited that you're going to try it. Please let me know how it turns out! Deeeelish. I think next time I'll use a little less vinegar and a little more soy sauce. Maybe 3/4 c vinegar and 1 c soy sauce. But very very tasty. Darby - So glad you liked it, and that you found a way to tweak to your tastes, and that there will be a next time! :) Murdo actually asks me to add more vinegar, which I did for this last batch. He likes his tangy, but I figured I'd keep the measurements equal for the recipe, just to keep it simple. Have a great rest of the week! But I'm definitely making this recipe soon. It sounds simple in process but complex in flavor (my favorite combination on hurried weeknights!). u know, my dad makes a sticky adobo, afterwards he removes the chicken, adds rice, and makes adobo fried rice. heaven on a plate. Anonymous person who mentioned the adobe fried rice: thanks. thanks and thanks. If you wanted to spell out the steps in monosyllables for that, we'd be grateful. Thanks for stopping by my blog, Jacqui! Hope you'll visit again soon. I'm sure I'll be by your blog regularly! Maddie - Not much defines the misery of cube life like the Excel spreadsheet. I'm excited that you're going to try this -- let me know what you think! And yes, it is a perfect weeknight meal (that lasts the whole week!). Anon - Adobo fried rice = Genius. I really think adobo sauce should be bottled up and used as a condiment on EVERYTHING. Stephanie - So glad to have discovered your blog! Looking forward to more great posts. NicoleD - It IS so good and so easy. :) Also, I've found that it's pretty easy to draw the line with kitchen things when I have no more room in my kitchen to store them all! Your recipe is featured on Gojee today. I'm a Mexican food specialist who is late coming to Filipino adobo, but I've had a few variations, including one I 'invented' myself, that included onion and pineapple... quite the bastardization. I'm going to try this. I added 1/4 C brown sugar and cooked in a slow cooker on high for 4 hrs. AMAZING!!!! Will definitely make this again. Thanks!!! I love adobo! Having lived in the Phillipines I really miss the food abd Phoenix sadly does not have any good Filipino restaurants! I have found I really like the flavor coconut vinegar adds and its easy to find at most Asian markets! Yea I find it kinda weird that there are tons of chinese, japanese, or thai resturants everywhere but filipino restarants are pretty much impossible to find.